Podcast: O que “Let’s take five” quer dizer? Hey, all. Nesse episódio do podcast Inglês Online eu falo sobre alguns outros idioms com os números five, nine e ten. Last episode I gave you two idioms with the word “two”, and this episode we take a look at expressions with numbers five and nine. So, what would you do if someone said to you “Give me five!”? Well, after you’ve listened to this podcast, you’ll know what to do. Just slap your open hand against their hand – which will be raised and waiting for the slap. That gesture, with the hands raised and the slap, is called a high-five. 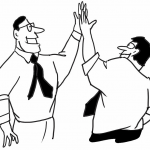 Americans love to high-five each other when they’re celebrating something, even something small, so if you’re around Americans and one of them says to you Gimme (=give me) five, just raise your hand and slap theirs. That’s all their asking! Here’s another one with “five”: Let’s take five. Let’s take five is short for ‘Let’s take five minutes off’. You know when someone says “I’m taking the day off”, meaning they’re not working that day? So when someone says Let’s take five, that means “Let’s take five minutes off”. Let’s take a short break. Let’s take a break that lasts approximately five minutes. Let’s take five. So when would it be usual for someone to say that? When, for example, you’re at some project meeting working on something with your team, and you guys have been working for three hours already, and the team leader decides it’s time for a break. He or she says Let’s take five. Or let’s say you’re in ballet practice right now, and you and other dancers have been working hard the whole afternoon. You’ve been working so hard that the ballet teacher looks at you and says John, good job. Great legwork today. So the teacher decides it’s time for a break and says to the class Let’s take five, everyone. And I also wanted to throw in a very popular set phrase that has the words nine and ten in it. When we say that something will happen nine times out of ten, that means that thing will almost always happen; that is usually what will happen. Example: Nine times out of ten Brazilians will eat rice and beans in a meal. Maybe I’m exaggerating? I don’t know. Do you eat rice and beans almost every day? Another example: a computer technician explains that even unexperienced computer users can solve most problems on their own. He says “Nine times out of ten, you can fix the problem yourself”. Here are my own examples: when I go to a café, nine times out of ten I’ll order a café mocha, which is coffee, milk and chocolate syrup. When I’m home for dinner, nine times out of ten I’ll cook my own meals. That means that I’ll almost always order café mocha, and almost always cook my own meals when I’m home. Also, notice how I said “Nine times out of ten I WILL cook my meals”, although I’m talking about a habit. That’s a topic for a future podcast or English tip. So what are your examples? Let us know in the comments and talk to you next time. Good morning Ana, nine times out of ten, I`m watching children`s program on tv instead watching adults program. Hi, Anaaaaaaaaaaaaa! Nine times out of ten I acess inglêsonline.com.br to study several things about English with your great tips. God bless you! Hi Ana Luiza, actually I agree with you nine time out ten od brazilians eat rice and beans in a meal. Hi Ana, I live in Spain but since I was in Brazil, I’ve bee followed your classes, what I can say due to i living here is that nine times out of ten spaniards eat “tortilla” in the lunch time. Hello, everyone! Obrigada por todos os exemplos… adorando ler. Nine times out of ten I’ll listen to one of the inglesonline podcasts and learn new words! I really like all the tips and examples you give us in every one of them… you rock, Ana! nine times out of ten I`ll turn back to this site.It`s great. Nine times out of ten i study english. Nine times out of ten I’ll be listening to an episode of Inglesonline Podcast everyday. If you were here, Ana, I would say to you gimme five, because your English tips are awesome. Thanks a lot for help us. I’ve learned much with your tips and your podcasts are very plain to understand and learning. * my doubt: in this case, Ana, “told me to take five” should I use “let’s” or something? Thank you again. I guess it’s more usual for someone to say “Let’s take five”, rather than tell you to take five… but I could see someone say that as well. Thank you, and I’m super happy to know you’ve been benefiting from the podcasts!! Hello Ana, These are great english tips. Well, nine times out of ten I´ll prefer to drink water or juice than soda. Also, nine times out of ten I´ll prefer to eat in a restaurant than in Mc Donalds. I use to listen the podcasts every day in the morning. Thanks a lot. Hi Ana! Nine times out of ten I’ll rather watch TV movies in English.Every day I learns some new. I never had any professinal help about my lessons.You are the only exception.I studies alone since the last december.But I studies English just for one reason:I love it.I hope you can understand all I did wrote. Thank you one more time!! Congratulations, Jennifer ;) You are doing really well. Keep it up!! Nine times out of ten I’ll spend all day at my parent’s house. Nine times out of ten I will eat rice and beans, both in lunch and dinner. Nine times out of ten, I’ll read a book, rather than watch TV. Nine times out of ten, I’ll use my free time to access inglesonline.com.br and learn interesting things about English. Teacher, You can’t imagine how your podcasts help me a lot. I’m anxious now, about your intermediate course…when you think about show this course for us? Hiow do I say “lançar um curso” in english? It’ll be a little while still, since I’ve got a few other projects to take care of BUT I’ve started to plan the intermediate course. So.. we’re getting there. Your teachings are very useful, I hear all of them.God bless you. Previous Post “Estão dizendo por aí…” e outras expressões em inglês do Modern Family Next Post Como digo em inglês “Não tem jeito, não tem chance”?